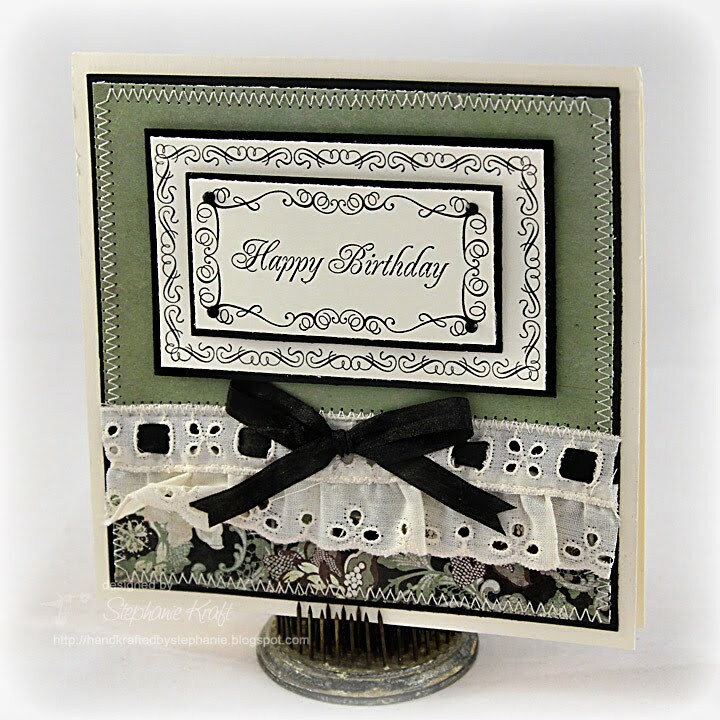 HandKrafted by Stephanie: Happy Birthday, Julie! Edit -- Better late than never.. I had this scheduled for Friday, but somehow my post got switched to a Draft instead.. I hope you had a great day, Julie! Hello everyone! I'm popping in here quickly to wish Julie Ranae a HAPPY, HAPPY Birthday.. and many more!! I'm getting ready to head out of town for my niece's wedding (actually, I'm already gone since this is a scheduled post). I didn't have time to make a new card for Julie, but I did have a card that I made for the JustRite booth for Summer CHA. Luckily, I haven't showed it here yet. My original card said Thank You, so I replaced my top layer with Happy Birthday. I hope you have a fabulous day, Julie! Accessories: May Arts ivory silk ribbon, Copic Marker 100, Kaisercraft rhinestones, Vintage lace, foam tape, sewing machine and ivory thread. Lucky Julie - it's certainly a gorgeous card! So pretty & elegant Stephanie! I am sure Julie will be tickled to receive this! Love the eyelet trim with the sweet bow! Elegant stamped borders! Love the lace! What a beautiful card! I love that lace and black bow!! BEAUTIFUL! Julie will def. LOVE this:) Thanks for sharing and joining in the birthday fun!! What a lovely surprise, Steph! I did indeed have a lovely birthday and in fact, I just returned home a short time ago from an extended weekend away with Paul to celebrate. What a lovely thought and I really do appreciate your kindness to think of me. Look forward to seeing you soon in The Cafe as our guest when we celebrate! Beautiful card, Stephanie. Absolutely wonderful color combination and awesome stamps to fit into those panels! Julie certainly is one lucky lady! Beautiful card! Love the colors and the lovely trim!